Legendary investors Warren Buffett once said, “Buy it thinking you will hold it forever”. This does look like a far-fetched idea at least for return hungry equity investors but who would have thought that a Bengaluru-based company, which debut on the stock exchanges more than two decades back, would became one of the top 10 bluechips with a market capitalisation of Rs 2.7 lakh crore on the BSE. Infosys was established by NR Narayana Murthy and six engineers in Pune with an initial capital of $250. It made an initial public offer in February 1993 and its shares were listed on Indian stock exchanges on June 14, 1993. Trading opened with a huge premium of Rs 145 per share, compared to its issue price of Rs 95 per share. In March 1999, it issued 20,70,000 American depository shares (equivalent to 10,35,000 equity shares of par value Rs 10 each) at $34 per ADS. The same was listed on the NASDAQ National Market. Since then, Infosys hasn’t looked back. From an initial capital of $250, it has grown to become a $10.9 billion (FY 18 revenue) company with a market capitalisation of about $40 billion. The IT bellwether and its subsidiaries had 204,107 employees as on March 31. Did investors make money in Infosys? Back of the envelope calculations suggests that if one had invested 10,000 or bought nearly 100 shares of Infosys back in 1993, it would be worth over Rs 2 crore as on June 12. The management has been generous in granting bonus since its listing. It has offered 1:1 bonus shares in 10 out of 11 years when it declared a bonus issue. In 2005, it announced a 3:1 bonus issue. 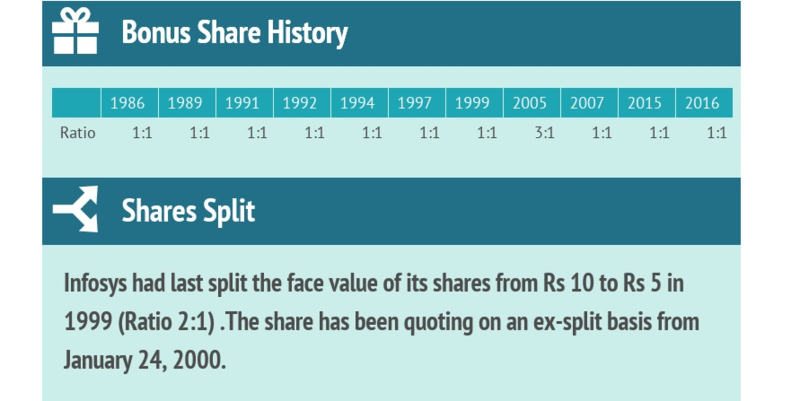 It had split the face value of its shares from Rs 10 to Rs 5 in 1999 (2:1). The share has been quoting on an ex-split basis since January 24, 2000. “If we take into account the bonus and stock splits, then value of the investment would have grown to Rs 2.1 crore, a compounded annual growth rate of 36.20 percent. Number of shares after adjusting for bonus would have risen from 100 to 17,064,” Ritesh Ashar, Chief Strategy Officer, KIFS Trade Capital, said. Total worth = Total number of shares 17,064 x 1,258 (close as on June 12) = Rs 2,14,66,512 (Rs 2.15 crore), indicating a CAGR of 36.20 percent. Narayan Bhat, Bengaluru-based investment consultant, first bought the stock way back in 1996 and continues to hold on to the stock. However, his preference seems to be drifting towards other IT companies. “Once upon a time, Infosys was the best long term bet for investors, because of its robust management, quality controls, and great quarterly and annual performance. It was the king of the software sector. That is not true anymore,” he said. Should you hold Infosys or cash out? After remaining under pressure for an extended period on account of tightening foreign policy, corporate governance as well as a macro factors, Infosys has gained momentum in recent times. Most analysts advise investors to hold on to Infosys for the long term. The stock is up a little over 20 percent so far in 2018 and nearly 32 percent in the last one year. Infosys reported a strong set of Q4 FY18 numbers and the management guided for a 6-8 percent growth in FY19 revenues, which is in line with industry growth. “Infosys has the potential to unlock value from digitisation over a period of time. It is advisable to hold on this bellwether to unlock the opportunity that the shifting business provides and continue enjoying the higher payout ratio,” Dinesh Rohira, Founder & CEO, 5nance.com advises investors. Sanjeev Hota, IT analyst, Sharekhan has a buy rating on Infosys with a target price of Rs 1,420 per share, which translates in an upside of 11 percent from Wednesday’s closing price of Rs 1,276 per share. “Infosys is geared up for building sustainable growth engines through significant investments in digital service capabilities, which provides huge room for growth. We see growth accelerating with improving demand traction from banking and financial services, insurance and healthcare verticals along with recent large deal wins,” he said.